Elvis Enthusiasts Unite: Pilot me. I wonder if, given a lot of time and inordinate amount of reflection, that I will see my condo's NOT yet closing (going on its being delayed four times now) as some kind of blessing in disguise. An exercise in patience. I wanted my quick-and-dirty trek to the Fall-colored Utah to be one filled with closing a bank account, paying off a loan and putting my face in a lot of tacos. All business and little pleasure. While I did get some of that done (especially the taco eating), I can't argue with how it played out. Saw a handful of pleasantly familiar faces, surprising most every one of the lot. Shopped some at what is still my very favorite record store. Survived on drive-through carne asada tacos and some homemade pumpkin waffles. 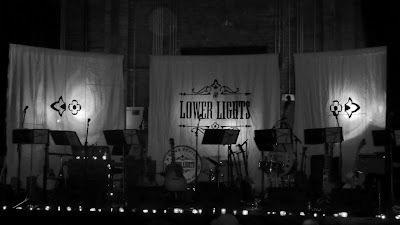 Finally got to see the Lower Lights create their 14-musicians-strong magic live, meeting some of the kind folks I've written with for a good number of weeks now (they were as great as I expected they'd be, yes). And, having secured four front row seats for my folks, sister and husband a month or so ago, I was able to surprise them by landing there. And, you know, if I could bottle the twin excitement of my mom and sister upon their discovering me in the theater, I'd be able to combat any and all sad days of my future. I really, really dig those kinds of surprises. There aren't enough of them, you know? Oh, and that snowstorm? The one that threatened all Saturday long, making a picture-perfect winter wonderland out of the night and following morning? It was my first real glimpse of Christmas this year. I'm in a plane and currently retreating to my Land of No Socks, but I sure enjoyed that fluffy stuff for all the hours I was able to. I still hope to close on my condo one day, but I'll stop holding my breath about it already. In the meantime, I'll be grateful for life's little curve balls, for the increasingly unique opportunities and experiences they afford me. :( So sad I turned those tickets down for our BYU ones! I think I would take seeing you and the Lower Lights any day! Sorry we missed seeing you this time around, but I heard all about the surprise reaction (a pleasant re-inaction of it tonight) and got a chuckle all the same. i figured it out. thank you!